Forthcoming Corineus String Quartet concerts Sunday November 25th at 3pm St Mary's Church, Penzance Mozart String Quartet in B Flat K172 Jeffrey Joseph Three Pieces for String Quartet (world première performance) Beethoven String Quartet No 10 in E flat major 'Harp', Op 74 Admission free - just turn up! Meanwhile… looking way ahead to 2019… on Sunday March 31st 2019 we will be premiering a new string quintet written for us by Pippa Drummond, with our guest ‘cellist Patrick Gale. We are a string quartet mainly specialising in repertoire composed since 1850, although our programmes sometimes include earlier works, such as Purcell’s great Chacony. We’ve also recently developed a liking for Schubert! Since our successful debut concert in 2012 performances have included: Debussy’s forward-looking String Quartet in G minor (1893) Opus 10, a full performance of Samuel Barber’s Op 11 String Quartet (1936) with it’s famous Adagio second movement, Brahms’ beautiful, autumnal Clarinet Quintet in B minor Op 115 (1891) with guest soloist Patrick Saunders, the Cornish premier of Philip Glass’s 1983 quartet Company, Shostakovich’s quartets Nos 4 (1949) and 8 (1960), Vaughan Williams’ first quartet (1908) and Stravinsky’s Three Pieces for String Quartet (1914). In 2014 we gave the world première of Ivor Gurney’s Quartett in A (1919) in a concert with Elgar’s String Quartet (1919). We’ve also premièred four string quartets by our ‘cellist Stephen Brown. Our growing Schubert interest is demonstrated by performances of the C minor Quartettsatz (1814), the 'Rosamunde' Quartet (1824) as well as the fabulous String Quintet in C (1828) with guest ‘cellist Patrick Gale. We have also enjoyed working with mezzo-soprano Maria Heseltine on works by Butterworth, Warlock and Barber. With guest players Laura Parfitt (viola) and Patrick Gale (‘cello) we were pleased to perform Schoenberg's luscious sextet Verklärte Nacht (1899) and Brahms B-flat major String Sextet No 1 (1860) in March 2017. Now established as quartet in residence at St Mary’s Penzance, the Corineus String Quartet also performs in Truro, St Ives Newquay and Falmouth and looks forward to continuing future collaboration with local soloists and guest players, as well as further promoting local composers Click here for details of future concerts! And click here for clips of us playing! CONTACT US If you’re interested in booking the Corineus String Quartet for a concert, or if you’d like any other information please email us by clicking here. LINKS THE SAFFRON STRING QUARTET Cornwall-based light music quartet for your wedding or special event. ST. MEWAN SINFONIA Cornwall’s string orchestra. TOTNES MUSIC NOW we have played in Totnes (even though it’s across the border)! 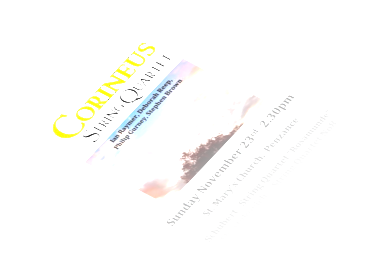 The CORINEUS STRING QUARTET is named after the legendary founder of Cornwall. Click here for the Wikipedia article! Here are programme notes from previous concerts by the Corineus String Quartet. Unless otherwise stated, all the notes are by Philip Gurney. Click on each one for the link. TO THE WEBSITE OF THE CORINEUS STRING QUARTET We are a classical String Quartet based in Cornwall, UK, performing several concerts each year throughout Cornwall. We aim to introduce audiences to new repertoire as well as to established works. If you’re looking for a quartet for your wedding or background light music for a function, please see the website of our sister group, the Saffron String Quartet, which you can reach by clicking here. The Corineus String Quartet mainly specialises in the string quartet repertoire composed since 1850, although programmes may also include earlier works, such as Purcell’s great Chacony. We’ve also recently developed a liking for Schubert! Since our successful debut concert in 2012 our performances have included: Debussy’s forward-looking String Quartet in G minor (1893) Opus 10, a full performance of Samuel Barber’s Op 11 String Quartet (1936) with it’s famous Adagio second movement, Brahms’ beautiful, autumnal Clarinet Quintet in B minor Op 115 (1891) with guest soloist Patrick Saunders, the Cornish premier of Philip Glass’s 1983 quartet Company, Shostakovich’s quartets Nos 4 (1949) and 8 (1960), Vaughan Williams’ first quartet (1908) and Stravinsky’s Three Pieces for String Quartet (1914). In 2014 we gave the world premiere of Ivor Gurney’s Quartett in A (1919) in a concert with Elgar’s String Quartet (1919). Other premieres have included four string quartets by our ‘cellist Stephen Brown. Our growing Schubert interest is demonstrated by performances of the C minor Quartettsatz (1814), the 'Rosamunde' Quartet (1824) and most recently two performances of the fabulous String Quintet in C (1828) with guest ‘cellist Patrick Gale. We have also enjoyed working with mezzo-soprano Maria Heseltine on works by Butterworth, Warlock and Barber. Now established as quartet in residence at St Mary’s Penzance, the Corineus String Quartet also performs in Truro, St Ives Newquay and Falmouth and looks forward to continuing future collaboration with local soloists and guest players, as well as further promoting local composers. Scroll down for details of future concerts!